On my last Photo Friday post, I showed you what closeness looks like around here without Chris. This is what it looks like with Chris. Do you have a pet that does this? 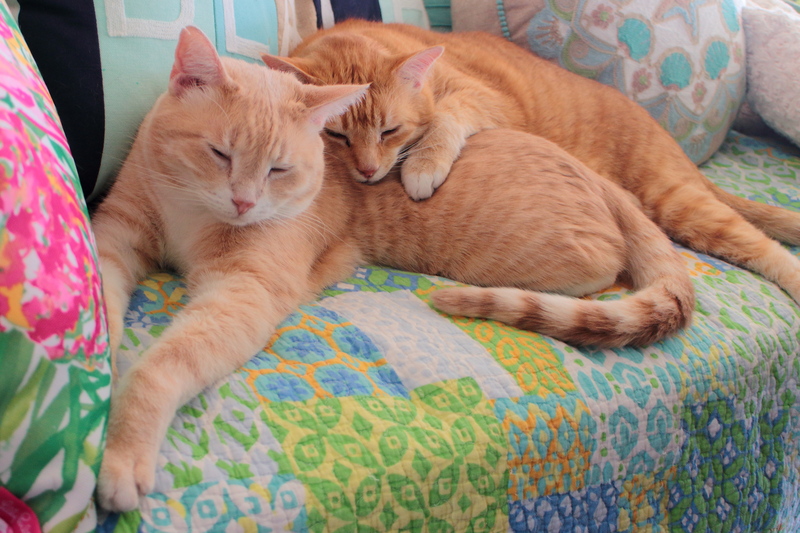 This entry was posted in Uncategorized and tagged Cats, closeness, cute, ginger on April 6, 2018 by Charles Huss. That would make for a nice piece of art. Perhaps I should see what I can do with it. While I have had multiple cats in my life, since I married David we’ve only had “onesies” – Sammy would lie on/next to my leg all the time for naps – Ted is not like that at all. When I DID have four cats at one point, they would frequently ALL be on the bed for naps but not “piled up”…..I think this is adorable though – Chris is a snuggler! I wish! Jiminy wants to cuddle Chewie. Chewie doesn’t like to cuddle much. They chase and like to groom each other. Chewie has needy humans and a needy cat for him. Sometimes when Jiminy wants to cuddle with Chewie, Chewie gives him the evil eye and Jiminy runs to me for a head rub. Jiminy is skittish and very shy. He’s doing really good but still very shy and I’m so happy he likes me enough that I like coming in 2nd to Chewie. Wish I had a lap cat, miss my lap cats. I’m pretty lucky in that all three of our cats are lap cats and Puck was a lap Cat too. That is 100% Noelle and Raz!!! Mom calls them “the amazing two headed cat” sometimes! A beautiful painting in ginger colors. When we had two cats they were side by side if they were afraid of, for instance, a thunderstorm or other loud voices. Maybe you need another cat. I would take every homeless cat, if it would be possible. This is beyond adorable! Nope, neither of my boys do this but I sure wish that they did!! It sure is a pleasure having Chris around. I think Chris is an original – We rarely lie close together, and never like this. He definitely is one of a kind. Aw! How charming! Of course ginger cats always are charmers, I think. I’ve had one, and he, of course, was a charmer! And lap cat, though he was a huge cat at almost 24 pounds! Chris used to be nine pounds and then twelve and next thing I knew he was eighteen pounds. I like big kitties, especially tabby cats! That was an interesting story! It sounded a lot like my experience with my late Louie the ginger cat. He was very aggressive toward other cats, but very loving and friendly. toward people. We had a cat named Princess that loved people but hated other cats. Yep, Wally lays all over Ernie if given the chance. I wonder if it’s a ginger cat thing? Although Frankie doesn’t do that. Now THAT is a wonderful “AWWW…” moment, for sure. PURRS. No but I only have one cat. That’s awwww-some. My Topper (who passed in December) and Lexington snuggled all the time. Don’t you love it when they do that. That makes me sad for Lexington. If they are on the bed, Kommando will sleep with her head on Snoops’ back. In “public” they only sleep next to each other if the house is chilly.